The New Year is just around the corner, and if you’re like me, you feel the need to organize! The holiday is over, and it’s time to find places to store new gifts you received or purchases from all of those great holiday sales, such as a new coat, new shoes, serving dishes, linens, clothes, etc. Or perhaps the amount of your holiday decorations has expanded. My next project will be cleaning out a small hall closet that has been used for miscellaneous storage and boxes upon boxes of photos. I plan to turn it into a coat and shoe closet. Everything will come out of the closet, and then decisions will be made about the contents. It may be time to set aside the photos in order to put together photo albums, or perhaps they can be scanned and saved to the cloud for preservation and future use. The miscellaneous items will need to be sorted through and divided up into Sell, Donate, Store Somewhere Else, Trash, and Keep. Next I’ll clean the closet and determine what type of closet system I’ll need to store the coats and shoes. A nice, sturdy rod will be needed, especially for the heavy winter coats. Shelves for shoe storage, and extra shelves above the rod will keep everything else organized. I can’t wait to get started on this project. I hope you will be inspired to tackle one or more closets in your house in 2019! You’ll be pleasantly surprised by how much more you can store in a closet that has been customized. We are here to assist you in any way possible, from free design consults, to delivery and installation. 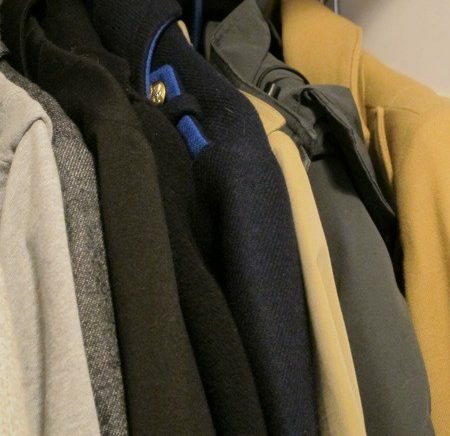 We take pride in our work and want you to be completely satisfied with your new closet system.